The Eastern Africa Province of the Jesuits confirmed the death of Victor-Luke Odhiambo, S.J., “with deep sadness and shock” in an announcement published on its Facebook account. According to the province, Father Odhiambo was killed when unknown assailants attacked the Daniel Comboni Jesuit Residence in Cueibet where he resided. 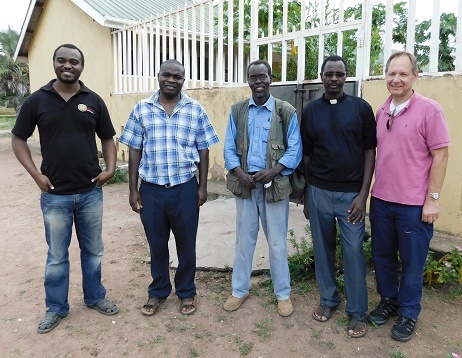 The province reports that four of the Jesuits in the community had already gone to sleep, but Father Odhiambo “was in the TV room when the assailants attacked.” “When the rest of the companions heard gunshots and noise, they pressed the alarm and the killers ran away—unfortunately, Victor-Luke was already dead,” the province reported. One of the Jesuits residing on the compound was awakened by fighting and shouting from the sitting room followed by two gunshots. He said six attackers ran off after students from surrounding dormitories began to rush to the Jesuit residence in response to the alarm. Father Odhiambo’s body was discovered after it had been confirmed that the attackers had fled the compound. The news was a shock to Jesuits around the world who had worked with Father Odhiambo in the past. In New York, America Media’s James Martin, S.J., said, “Victor-Luke was a wonderful person, a devoted Jesuit and a superb priest. He was warm, kind and friendly and exceedingly welcoming to me during my time in Kenya. Victor-Luke was dedicated to Jesus and to God’s poor, and was also widely respected among his Jesuit brothers. “The Eastern Africa Province, the Society of Jesus, the Catholic Church, and the world are all sadder places without him.” Gok State Information Minister John Madol told local media that the motive behind the killing was not clear, but that “one person has been arrested and is in custody.” Additional arrests are expected. The state government has declared three days of mourning in honor of Father Odhiambo. According to the province, at the time of his death, Father Odhiambo was the principal of Mazzolari Teachers College in Cueibet and acting superior of the local Jesuit community since January 2017. He had worked in South Sudan for approximately 10 years. Father Odhiambo was born on Jan. 20, 1956, entered the society on July 4, 1978, and was ordained a priest on Aug. 22, 1987. He took his final vows on May 30, 1993.